The MS-21 long-haul passenger aircraft has not yet entered the series, but is already compelled to wage “battles for survival” with unscrupulous American suppliers. Washington has forbidden to supply for hope of the Russian aviation industry the composite materials from which it is made. This will somewhat delay the construction, but will not stop. The vice-premier of the Russian Federation Yury Borisov, who oversees the aviation industry, told about this. Why is the issue with composite materials so important? The fact is that these lighter, more durable materials must replace metal in the design of the aircraft – titanium and duralumin alloys. Mass gain is about 5 percent. It is these percentages that should provide the MS-21 with an advantage over metal aircraft. In competition in the global aircraft market, every percentage of efficiency is in the account. Here the Americans, practically monopolists in the market of composites, decided to strike at the very patient. But the Russian industry accepted the challenge. 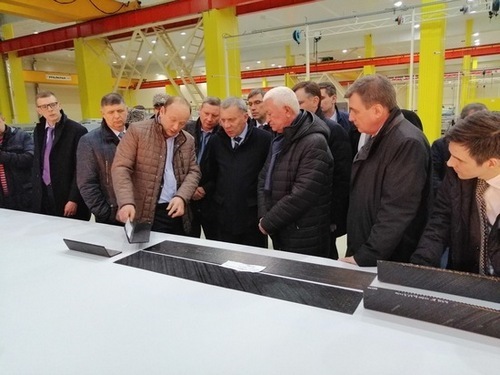 During his working trip to Ulyanovsk, Borisov visited the leading Russian company producing carbon fiber structural elements. He was shown ready-made composite caissons of the wing, spars, stringers, and other power elements of the aircraft design. All of them are made without the use of American materials. “American suppliers refused to supply certain types of materials that are the source for the production of“ black ”or otherwise – plastic, composite wing,” Borisov said after a working trip to the Volga region. – The necessary measures have been taken so that we import all the materials and produce domestic final samples that have confirmed their main characteristics. According to Borisov, this allows us to count on the fact that the design of the aircraft, in particular, the wing will not undergo redesign. -We will not hide – the plane will linger a little bit in mass production. We are planning to obtain a certificate (airworthiness. – “MK”) in 2020 and organize mass production in 2021, – Yury Borisov assured. He called the MS-21 the flagship project of the Russian aviation industry and recalled that aircraft of this dimension accounted for 67 percent of the world market. Only Russian airlines need about 860 of these aircraft. As told “MK” at the Ulyanovsk enterprise, the work on it is organized in two shifts. Atomatic lines work generally without interruption. Well, and American suppliers can only regret the hundreds of millions of dollars in lost profits.